A breast cancer diagnosis is often the climax to an agonizing set of days that started when a doctor found a lump. Though the wait for the diagnosis may be over, the patient’s new reality can be overwhelmingly uncertain. Aside from the body image worries a woman may have, she likely is wondering who will step in to juggle all of the responsibilities she typically does. How will she pay for treatment? If she has young children or grandchildren, who will watch them? If she cares for an older relative, who will take her place? If she lives out of town, how will she get to treatment and will this new gas expense be a financial burden? What about her job? There are so many logistics and we haven’t even broached the myriad of treatment options. A woman can easily feel like she’s standing at the foot of gigantic mountain, unsure how to climb. That’s where Teri Sabo comes in. 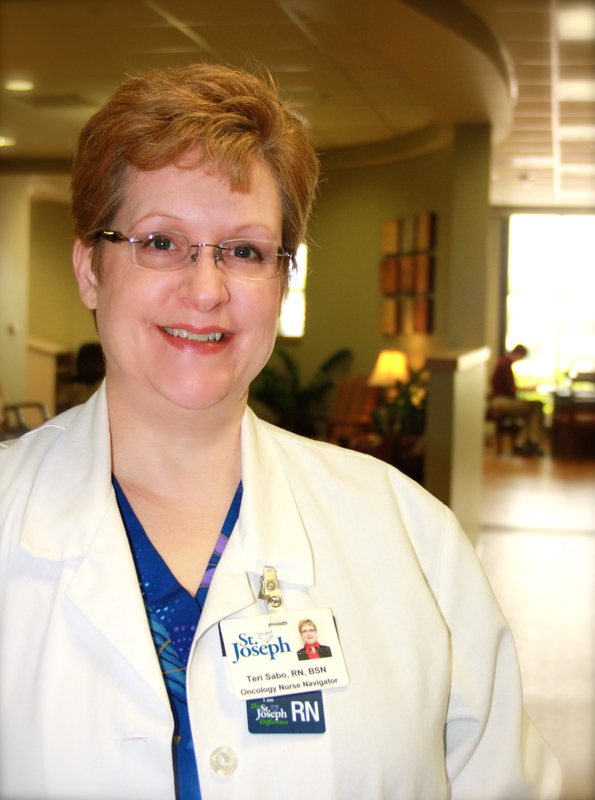 A nurse for 27 years, 17 of which were spent helping cancer patients, Sabo is St. Joseph’s new Oncology Nurse Navigator. She is the ski lift to help women climb the mountain. Sabo likes to refer to herself as a concierge service, but another way to describe her might be a caring and informed girlfriend whom breast cancer patients can count on to help them through this bewildering time of information and emotions. With a primary doctor’s and patient’s permission, Sabo guides a patient through the diagnosis, treatment and recovery process and among the many specialists appointments the patient is likely to encounter. Located in the first office in the lobby of the cancer center, Sabo is easily accessible – in person, on the phone or by e-mail. She hopes to take some of the stress and effort off the patient.